Kalank: Teaser of Alia Bhatt, Varun Dhawan’s period drama to be out 12 March; film will release on 17 April | BollyWood News……. Abhishek Varman directed multi-starrer Kalank, which was slated for release on 19 April, will now hit the theatres on 17 April. According to trade analysts, this will give the film a five day long extended opening weekend. The trailer of the epic drama will be out on 12 March. Recently, the makers had unveiled first look stills of all the characters in the film. 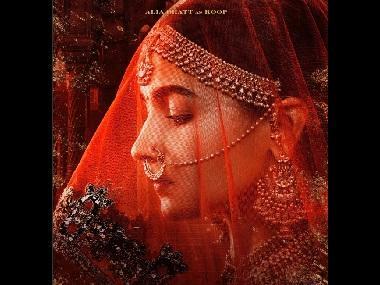 Kalank stars Varun Dhawan as Zafar, Alia Bhatt as Roop, Sonakshi Sinha as Satya Chaudhry, Aditya Roy Kapur as Dev Chaudhry, Sanjay Dutt as Balraj Chaudhry and Madhuri Dixit as Begum Bahaar. Karan Johar had on 6 March released a teaser and had in an Instagam post, recollected recollected how the film was actually conceptualised by his father, Yash, 15 years ago. It was the last film he worked on before he passed away. The filmmaker had called the film a ‘story of turbulent relationships and eternal love.’ Kalank will be set in 1940s, around unrest and turmoil faced by India and Pakistan. The film is being produced by Karan, Sajid Nadiadwala, Hiroo Yash Johar and Apoorva Mehta. It has been co-produced by Fox Star Studios.